Key Features Short, eloquent, popular science narrative history appealing to readers of Longitude, Fermat's Last Theorem and The Arcanum Will do for cartography what Longitude did for navigation By one of the best writers on India: John Keay is the author of India: A History, published by HarperCollins. 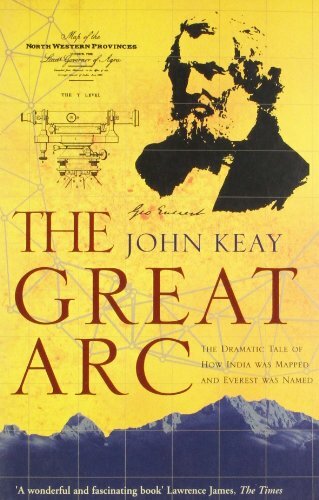 About the Book: The Great Arc The Dramatic Tale of How India was Mapped and Everest was Named A vivid description of one of the most ambitious scientific projects undertaken in the 19th century, and the men who undertook the measurement of the Himalayas and the mapping of the Indian subcontinent: William Lambton and George Everest. The graphic story of the measurement of a meridian, or longitudinal, arc extending from the tip of the Indian subcontinent to the mountains of the Himalayas. Much the longest such measurement hitherto made, it posed horrendous technical difficulties, made impossible physical demands on the survey parties (jungle, tigers, mountains etc. ), and took over 50 years. But the scientific results were commensurate, including the discovery of the world's highest peaks and a new calculation of the curvature of the earth's surface. The Indian Mutiny of 1857 triggered a massive construction of roads, railways, telegraph lines and canals throughout India: all depended heavily on the accuracy of the maps which the Great Arc had made possible. About the Author: John Keay John Keay is an author and broadcaster specialising in Asian history and current affairs. His other books include: Into India, When Men and Mountains Meet, Eccentric Travellers and Explorers Extraordinary. He lives with his wife Julia in Argyll, Scotland.